Obituary for Jane M. Barnard | D.L Calarco Funeral Home, Inc.
Jane M. Barnard, 82, formerly of Cape Vincent, passed away June 15, 2018 at Samaritan Keep Home where she had been a resident since 2014. Mrs. Barnard was born August 31, 1935 in Delaware, OH, daughter of Horace and Gertrude Snider Martin. She graduated from Marysville High School in Ohio and attended the University of Wisconsin for three years, where she majored in art as a sculpturist. On October 20, 1956, she married Robert R.V. Barnard in Richmond, Indiana. Mrs. Barnard bred and raised Morgan Horses, seeing some of them become champions. 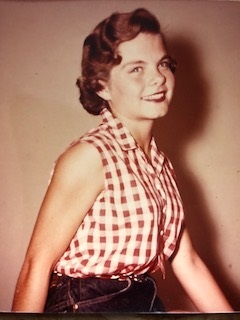 Surviving besides her husband are, two sons, Robert Jr. (Leanne), Montgomery, VT, John (Sharon), Cape Coral, Florida, a daughter, Saundra (Sandip) Badhe, East Granby, Connecticut, a brother, Robert Martin, Marysville, Ohio, eleven grandchildren, eleven great grandchildren and two on the way.